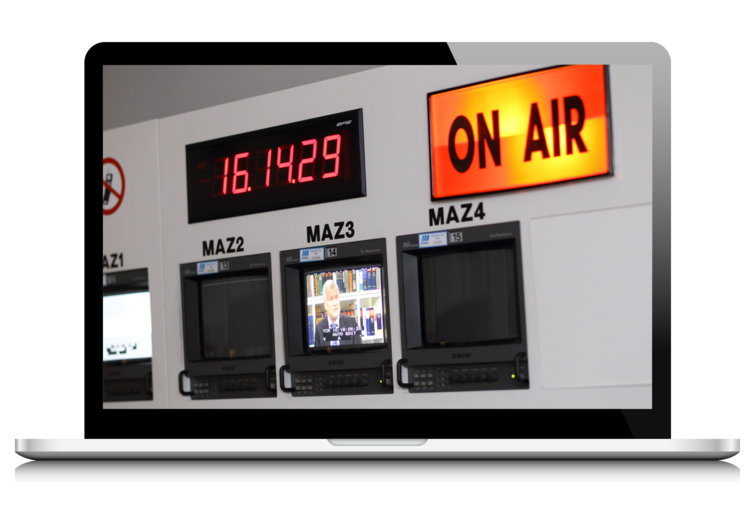 IMS Webcaster Software imports the signals from numerous media sources such as audio/video signals, video players, presentations, websites and many other types of digital media – then combines and synchronizes them into ONE signal for Live Streaming and Recording. Use Webcaster to transform a video signal, or any other media content, into an Internet Broadcast for PC and mobile devices. Be the Director: Switch between individually customized templates to steer the user’s attention towards relevant content. Professional sequence of events: Start your broadcast, for example, with an introductory Welcome Screen. Switch to a multi-window template with the speaker in the large window. If you want the webcast to focus on his presentation, with one mouse-click you can easily switch to a different pre-configured template to show his figures and graphics in a large window – while he is still talking in a smaller window. Individualize: You can customize and prepare the templates by adding logos, headers, speaker information, images and other content prior to the event. More content, such as important messages or new speaker names, can also be added on-the-fly during a live webcast. Use the possibilties which Webcaster offers you to produce a unique webcast, which showcases your company at the highest level. Live Publishing and Recording: Produce your event as ONE fully synchronized video stream (mp4/aac) which can be shown on all home computers and mobile devices. IMS Webcaster Software Test it 30 days for free! The IMS Webcaster software can access the output signal from all Capture Cards (WDM standard) and other direct sources or signals (USB, Screen Capture etc.). Use your equipment: Connect an input signal to your computer. The Webcaster software recognizes this as a live input signal, and makes it available as a media source. 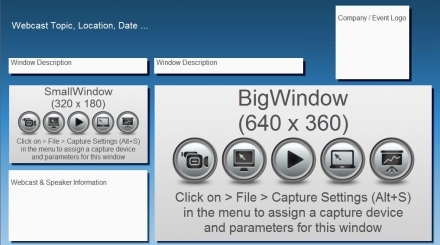 Camera “Plug in”: The Webcaster software recognizes almost any camera – whether simple USB webcams, or high-end DVI,HDMI,SD/HD video cameras (via capture card). 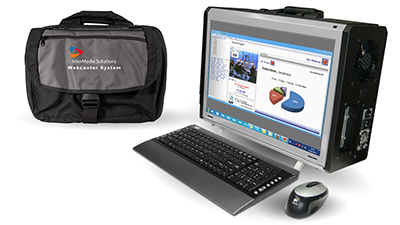 Webcaster System (see photo): Our mobile hardware system, complete with IMS Webcaster software and professional “Plug & Play” capture cards. Use the many options to make important content available in your live stream, easily and in top quality. Monitor capture: Webcaster can capture and record anything which is being shown on your screen and add it 1:1 to your live stream. You can make a full screen capture, or capture certain areas and single windows to make content such as presentations, video playback, Skype conferences and web pages part of your broadcast. Audio Mix: Capture and mix internal and external audio sources. For example, you could include the audio from a Skype call without having to show the related video picture as well. On-board Media Player Use the integrated Webcaster Media Player to add extra audio/video content to your live stream – such as live video links from remote locations, advertisements, trailers, image films or other pre-recorded content. Rich Media: Show complete web sites, include Flash and HTML5 animations, news feeds and much more. Present your Webcast in a fully customized look to match your company identity, and steer the viewer’s attention towards the relevant content. Off-the-shelf or customized templates: Webcaster comes with a large collection of pre-designed professional templates which you can use as a basis for your webcast project. With just a few mouse clicks, you can tweak these templates to fit your requirements – or you can construct and design completely new templates. In this way you can match the look and feel of your video communications to your company CD. Webcast directing: Put yourself in the Director’s chair and, with just a few mouse clicks, control exactly what the viewer is seeing during and after the event. Use the on-board Template Collection, and choose from over 35 pre-configured templates. Individualize your webcast with content layers, lower third graphic overlays, logos and web content. Combine the templates into a collection which best fits the sequence of your live event, and optimizes your control over what the viewer is seeing at any given time. Webcaster Software Test it 30 days for free! This is the distribution of a live video signal or feed inside a local Network. The stream doesn’t leave the business network/intranet and an external server is not required. IP network codec: The software modules IMS Webcaster and IMS EasyStream are equipped with a special IP streaming codec. IP producer/encoder: The IMS Webcaster and IMS EasyStream Producer can make a media signal, such as a video or presentation, available within a network, and their encoder modules automatically assign and display a unique IP address for each signal. IP player/decoder: The IP network stream can be accessed and played by any number of machines which belong to the network. Each machine requires the special decoder which is integrated into the Media Player module of IMS Webcaster. The Media Player can be assigned to a window in a Webcaster template, and can play back nearly all video formats as well as an IP stream. Alternatively, the IP network stream can be played back using the standalone IMS EasyStream Player which also has the special decoder. No server – minimal latency: Because no extra external server is necessary between the encoder and decoder, the IP stream can be made available with almost negligible delay or latency. High security – minimal cost: The data never leaves the local network structure, this makes the distribution very secure. Furthermore, there are no extra costs for traffic or internet bandwidth usage. Applications: Internal company communication, video signal distribution within a building (e.g. from lecture hall to lobby or other rooms and areas, from conference hall to breakout rooms). The simple, but powerful, IP Network and RTMP Encoder Software! The ideal tool to take ONE input media signal, and encode it for RTMP or IP streaming and recording. EasyStream may be the “little brother” of our IMS Webcaster solution, but it comes with the identical encoder technology, uses the same codecs and offers all the screen capture functionality. 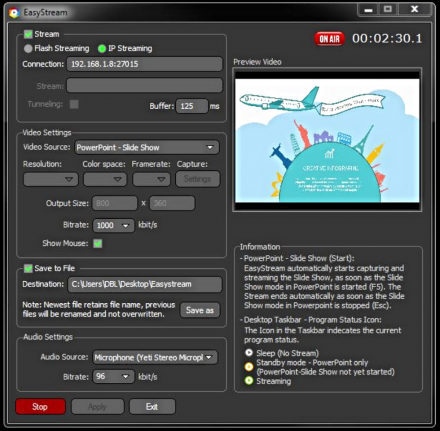 IP Network & RTMP Streaming: Use IMS EasyStream to encode ONE input signal – either for broadcasting as a video stream through any streaming server, or to be distributed as an IP stream inside a network. Each stream has its own unique IP address. Such IP streams can be played as often as you wish by using numerous instances of the IMS IP Network Player, or can be recognized by the IMS Webcaster software as an input signal – to be combined with other media signals and sources in a webcast template. Screen Capture: Use this function to record and stream all or part of a monitor screen, or designate a particular window for capturing. EasyStream runs in the background: Because EasyStream does not require an IMS Webcaster user interface to be constantly visible in the monitor, it can be minimized to the task bar and run as a background process. A typical IMS Software Solution scenario: A speaker installs IMS EasyStream Producer on his PC to make his presentation available over a network (by using the IP streaming function). This signal can be captured elsewhere in the network by a PC which has the the IMS Webcaster software. The IP stream containing his presentation can now be combined in a Webcaster template with other input sources – such as a camera signal of the speaker – and can be published to the intranet/internet as a complete webcast. Play IP Streams in a secure local network! Distribution of video streams and webcasts by LAN and W-LAN. 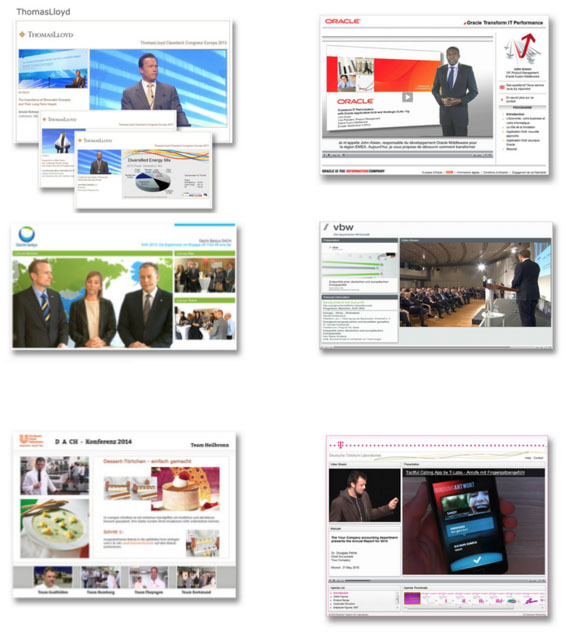 Secure localized intranet access for for businesses, trade fairs, conferences, universities etc. Plug & Play: Simply enter the IP address which was generated by the IP Encoder (IMS Webcaster or IMS EasyStream), and the video stream can be viewed at once in the IP Network Player. Perfect for multi-room events: Multiply your webcast and make it available on additional monitors, on projector screens and in breakouts and other rooms. Secure IP connection: Data is transferred exclusively using the IP addresses of the encoder and the decoder. An internet connection or server is not necessary. Questions? Please do not hesitate to contact us - we'll be glad to help.